Fresh asparagus and buttom mushrooms make this a perfect brunch or light dinner dish. Bring a large sauté pan of salted water to a boil over high heat. Add the asparagus and cook until tender crisp, about 2 minutes. Transfer the asparagus to a colander, refresh under cold running water to stop the cooking, and drain well. Set aside. In a medium saucepan, melt the remaining 2 tablespoons of butter over medium high heat. Add the onion and cook, stirring occasionally, until translucent, about 3 minutes. Add the flour and cook, stirring, until light golden brown, about 2 minutes. Add the stock; bring to a boil, stirring briskly, and cook until thickened, about 1 minute. Remove from the heat. Add the cream and ¼ cup Gruyere cheese, whisk until smooth. Season to taste with salt and pepper; set aside. Preheat oven to 350° F. Butter a 13 x 9-inch baking dish; set aside. To assemble crepes (recipe below): Place 2 tablespoons of the cheese sauce down the center of a crepe and top with a spoonful of the cooked mushrooms. 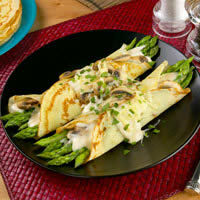 Arrange 3 asparagus spears down the center of the crepe so that the tips extend just beyond the edge of the crepe. Roll up and place, seam side down, in the prepared baking dish. Repeat with the remaining crepes, sauce and filling. The crepes should fit snuggly in the dish. Sprinkle the remaining ½ cup grated Gruyere over the tops of the rolled crepes. Bake, uncovered, until the crepes are warmed through and the cheese has melted, about 12-15 minutes. If you prefer a browner top, place under a heated broiler just until golden brown. Serve immediately. Once you have incorporated all of the flour, whisk in the melted butter and enough of the remaining milk to make a batter the consistency of heavy cream. Let rest at room temperature for 30 minutes or cover and refrigerate overnight. If you refrigerated the batter, bring to room temperature before proceeding - you may need to add a bit more milk to the batter if it has thickened too much overnight. Heat a traditional, seasoned, steel crepe pan or 8-inch non-stick sauté pan over medium high heat. Using a pastry brush or paper towel, brush or wipe the pan with a thin film of the melted butter. Add a scant ¼ cup of batter and immediately rotate the pan, lifting it off the heat, so that the batter swirls and forms a thin even layer over the surface of the pan. Place the pan back on the burner and cook until it just begins to brown underneath and the top surface looks set, about 1minute. Using the edge of a spatula, loosen the edge of the crepe from the pan and flip (your fingers work best at this point!) Cook just until browned lightly, about 1 minute. Transfer the crepe to a plate. Repeat with the remaining batter stacking the crepes directly on top of one another when cooked. Crepes will keep tightly wrapped in the refrigerator for 3 days, or frozen for 1 month. Let frozen crepes come to room temperature before separating from the stack.